Tread carefully in the land of the Iksar! First off, yes, it's not 100 percent accurate. Everquest is a BIG game and it's constantly being tweaked and updated. But this guide is extremely accurate, well-organized, and full of more useful information than any EQ Web site I've visited (and that's been plenty). * EQ Jargon dictionary -- Read it, otherwise entries on why "training an NPC" is bad will just be mystifying. * A similar write-up for each race, not sparing, say, humans; they're a bad gaming choice in most cases, sorry. * Finally, there's the spell listings, which include all the spells and bard songs in alphabetical order and more detailed information on the ones level 24 and under, including what category of spell it is, mana cost, estimated damage (if appropriate) and a very general description of effects. I also applaud Prima for making it a non-spoiler guide. Starting cities are mapped, general information about the continents are given, and spells up to level 24 are fully detailed. Beyond that, information gets very sketchy (although all the spells in the game at the time of publishing are included). And you know, that's good. EQ isn't a videogame to be solved. It's one to be experienced. And if you have a guide book open in your lap while playing, guiding you through it, you'll miss what's great about the game. And a final note: I own a number of Prima guides, and this one has the best dollar-per-pages ratio of any of them. I suspect they could have gouged consumers at least $$ more without them noticing (I certainly wouldn't have), and I thank them for not sticking it to the poor EQ-addicted masses. EQ is a much different game on the Mac than it is on the PC. I play the Mac version and this book is actually still helpful for getting started in the game. My 11-year-old son just started playing EQMac and he reads about the different zones and characters and NPC's in this book a lot. He's actually got a lot of knowledge out of it and its given him ideas for new zones to visit as well. If you are playing the PC version of Everquest this book might be past its prime. For those of us living in the EQMac world however, there is still a lot of life within its pages. 5つ星のうち3.0Useful if you have a custom shard to play on. This is a useful book if you play on a custom emulator shard. It is not that good for the actual live version of the game. It was nice in its day, but thirteen years later, the game has advanced far beyond this book. Again, great for some custom shards. 5つ星のうち5.0Fironie vie! Oh how I love you! 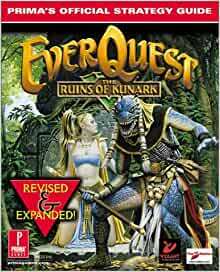 This expansion is what settled me into my long love for Everquest and everything to come. So when I picked up the manual, I knew I had something amazing in my hand. I loved reading through old spells, old dungeons, and the lore of kunark once more. I found this book invaluable before being able to alt+tab out of EQ. Now it's a bit outdated and the information can easily be accessed online. I still reference this book for basic skill lists and basic recipes for tradeskills. The merchant lists for the cities that do have maps are pretty handy.